On the 29th September 1885 Blackpool first ran it’s famous trams. There have been a number of celebrations over the years featuring the trams at various milestones, 2015 being no exception. A superb event was organised by Blackpool Transport to commemorate 130 years of service over the weekend of the 26th and 27th September featuring many ‘heritage’ trams. 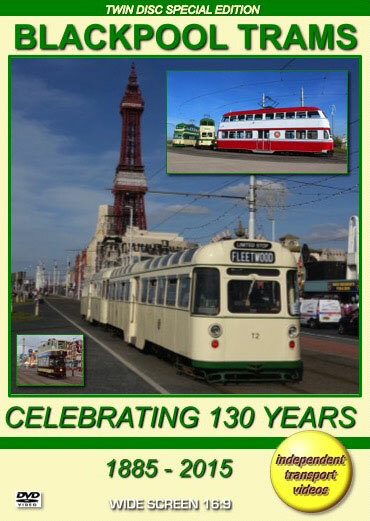 The last ‘celebration’ our cameras filmed at Blackpool was in 2010 as the trams marked their 125 years of service. That was also the final time that the ‘old’ trams were in charge, soon to be making way for the new fleet of 16 Bombardier Flexity trams that entered service at Easter 2012. So, in order to record the events of 2015 our cameras spent the entire weekend in Blackpool filming the action along the ‘Golden Mile’ – actually between Starr Gate and Fleetwood! Some preserved Blackpool Corporation buses even played a part in the celebrations, as they ran over the former ‘inland’ tram routes, long abandoned by the trams. The buses included Leyland Titan PD3A 501, Leyland Atlanteans 334 and 362 and single deck AEC Swift 554 – all are seen over the two days. As there was so much action, we have had to put the programme on two discs, part one being filmed on Saturday 26th and part two on Sunday 27th September. Our Saturday filming starts bright and early at Cavendish Road, near Bispham on a sunny, blue sky morning. As we head south along the promenade, we film the Flexity trams running in normal service. The “heritage” trams start to appear from 10am as we reach Gynn Square. Our cameras continue filming at North Pier, Tower, Adelaide Street West - for the buses, and on via Central Pier, Manchester Square to Pleasure Beach. Here we board Open top Balloon 706 for a ride along the promenade back to North Pier via Bispham. A further ride is taken on Open Boat 600. After visiting Fleetwood we return on Centenary 648 to North Pier. A visit to Rigby Road tram depot is made to see the trams returning from their duties and Engineering car 753 is seen moving the trams around the depot. The final scenes of a perfect day are night time shots at Bispham. Sunday morning also dawns bright and sunny as we board, at Bispham Twincar 272 with trailer T2 for a ride to Pleasure Beach. On arrival we see a good number of ‘green & cream’ trams awaiting their passengers to enjoy a day out celebrating the trams. We travel on Balloon 701 to North Pier. From here we record all of the action for you at locations including Manchester Square, Rigby Road, Central Pier, Tower and even more at North Pier! Rides are taken on Marton Standard 147, Balloon 717 and Balloon 723. Our programme draws to a close at night time at Pleasure Beach when we board Open Boat 230 for a tour of the Illuminations. The tram is packed full of happy holiday makers, all enjoying themselves as they ride along the promenade at Blackpool on a tram… that’s just what people have been doing here for the past 130 years, and long may it continue! Duration : 124 minutes (approx).